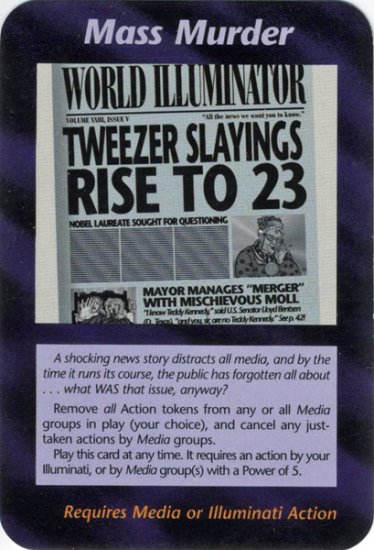 I was just expressing somewhat recently, that I missed seeing the Illuminati card thread. But now, I never wanted to see a card about Oslo. These cards are very spooky, Mulder. And what is most important of this card is its function. "A shocking news story distracts all media, and by the time it runs its course, the public has forgotten all about...what WAS that issue, anyway?" That happens monthly on the MSM. If there were a picture of Casey Anthony on that card, then I'd be impressed. Any chance of you not trying to derail this thread? PLEASE!!! I find it interesting and would like to hear from other ATSers as you have already stated your view, sadly several times. How many times can it just be coincidence? This card Game comes up in major events time and time again, Why? Because it has potential major events on its face. A statistician could break it down for you, but given the past rate of the things that have happened, depicted in the cards, there are probably better odds for something to happen than not happening. I feel some day that these cards might reveal their true meaning, but until that day I find them nothing more than propaganda aimed at an acute group of people who will gladly chase their tails. I also miss the thread and we only got to afew of the cards. Are the Cards possibly... predicting the past? Since the stock market was believed to be a no-risk, no-brain world where everything went up, many people poured all their savings into it without learning about the system or the underlying companies. 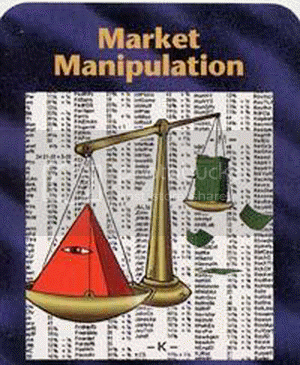 With the flood of uneducated investors, the market was ripe for some manipulation and swindling.